Photo courtesy of Doug Price. US Signal Corps photo, taken on 25 Feb 45 in Bubingen, France. The two soldiers are of the 83rd Division, the patch has been censored on the pic. 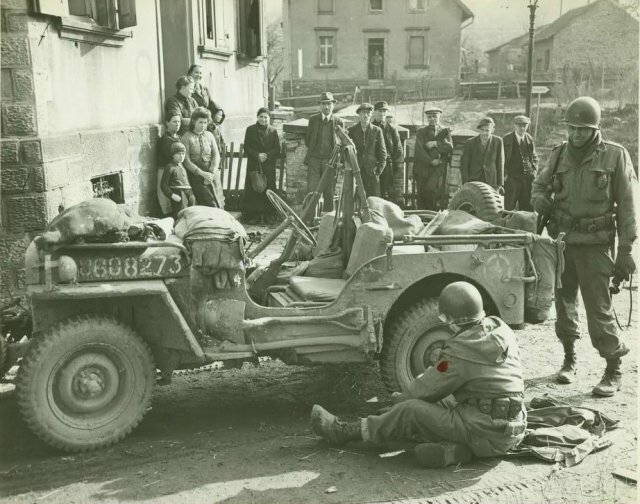 Dough says, “I think this is an extremely good shot of a combat jeep-notice the Garand with a grenade launcher,and one of the very few wartime shots you will see with a launcher sight mounting disc actually in use on a Garand.